In the summer of 1864 the Kiowas held their annual sundance at the junction of Medicine Lodge Creek and the Salt Fork of the Arkansas River, in what is now the state of Kansas. Because of a great abundance of the ragweed plant growing in this area, this sundance came to be known by that name by Kiowa calendar keepers and historians. Immediately following the ragweed sundance, most of the Kiowas moved to Ft. Larned to draw annuities and rations promised to them by the U.S. Government. The once great bison herds, principal source of food for the Kiowas, were being rapidly decimated by increased European travel across the plains, and from white sport hunters and government supported buffalo hunters, thus causing the Kiowas to become more dependent upon government subsidies for survival. While camped a short distance from the fort, the Kiowa women staged a scalp-dance to honor a group of warriors who had recently returned from a successful war expedition against an enemy tribe. In the scalp-dance, only the women participate while carring and wearing war trophies taken from the enemy such as: scalps, warbonnets, weapons, shields, etc. At this same time Chief Set-Angya (Sitting-Bear) and his cousin approached the fort to meet with the post commander. A young gate sentry challenged their approach while waving his weapon in their direction and Set-Angya, not understanding the sentry's challenge or intent, shot two arrows into the sentry while his cousin also fired several rounds from his pistol at the sentry. This action created a general panic and defensive positions were taken by the soldiers in the fort, as well as by the Kiowas in their village. 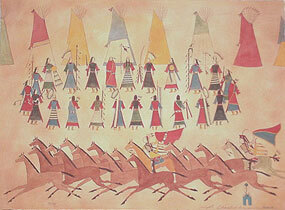 During this initial excitement a group of Kiowa warriors rushed the soldiers' horse herd, which was grazing outside of the fort, and stampeded the herd through and to the far side of the Kiowa village. Not wishing to risk an attack upon a well defended fort and knowing that the soldiers dared not mount an assault on the village on foot, the Kiowas leisurely dismantled the camp and moved away from Fort Larned in the evening, taking the soldiers' entire horse herd, mules and cattle with them. This event is regarded by the Kiowas as one of their first hostile encounters with U.S. troops, but nearly three decades of constant and often tragic warfare would follow for the Kiowas and the other tribes of the great plains. The pictograph image in the lower right corner of this image is the same as that entered by Little-Bear in his calendar record of this event.